For an application to run on an unmodified XBOX, it must be digitally signed my Microsoft. A modded XBOX does not check for a digital signature and will run any application. - Modchip: internal chip placed inside of the xbox. - Softmod: Loophole in xbox software security. Most popular softmods, such as UXE or NDURE, are installed through a modified gamesave. Softmods have become very stable and safe with recent advancements. - TSOP flash: meaning 'Thin Small Outline Package', a TSOP flash is the process of jumping pins of the TSOP to make it writable, after which a software exploit is used to flash (replace the software of) the chips with unofficial software. 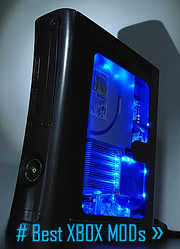 The recent popularity of the Xbox has inspired efforts to circumvent the built-in hardware and software security mechanisms (sometimes in order to use the Xbox as a low cost web server), as well as to add customized design touches to the console's case (similar to PC case modding). Hardware modding can involve anything from simply replacing the console's green decorative "jewel" with a custom-designed one to opening up the case and installing a modchip. Modding an Xbox may require opening the Xbox case, and would certainly void the Xbox's warranty. Also, most internal hardware modifications will render an Xbox unable to participate in Xbox Live, which has forced many modders to use a switch that turns on and off their modifications. As of November 2004, Microsoft has been taking new actions for banning Xboxs with hard drive modifications from the Xbox Live service. One such successful use of Live to discourage modding was when the hit game Halo 2 was released, and many owners of modded consoles found out that they were permanently banned from the Xbox Live service. Xbox and X 360 Firmware mods and PC connectivity kits, USB hardrive adapter to let you play backup dvd iso copies. Mod HDD SATA adapters. Fractal 360 , Globe 360, NME-360 ModChip and other Xbox ModChips. Free shipping to USA and Canada + WorldWide delivery. Xbox owners can do the following modification to their console: Xxbox case mods - where the case (cover or shell) of the xbox is replaced or modified. LED displeys added or special "skin" sticker applied. Light LED mod is when Xbox leds are replaced with a differnt color lights. Controller modifications include altering plugs to use Xbox joysticks on PC or using adapters to connect PC Keyboard and Mouse to the X - perfect for playing FPS with mouse trageting. Jewel halo cheats tricks gem MS X-box upgrades and hacks for exterior hardware light.